If you have already seen our first ever post on Alps and Abroad, you will know that we, Natascha and Sophie, live in Innsbruck, the capital of Tyrol. Since many of you probably don’t know Innsbruck that well, we figured we’d introduce you to our city and show you all kinds of different places and spots we love by starting a little series all about Innsbruck. We want to start this series by talking about the most known and famous sights of Innsbruck. So, let’s call this one the Beginner’s Guide. Innsbruck, to a foreigner, may not be the best-known city in Austria, but it is definitely one of the most beautiful ones and has a lot to offer, regardless of the season. The best thing about Innsbruck is that it's surrounded by nature offering you endless possibilities and activities to explore: Do you want to go skiing? It takes you a few minutes to get to multiple great skiing resorts. Do you want to go hiking? Just look around and you'll find various mountain ranges with beautiful hikes (which we'll present you in future posts). Do you want to go swimming? There's a vast number of lakes close to Innsbruck. There is no chance you will ever get bored when visiting Innsbruck. Of course, so many possibilities can be quite overwhelming and you might need some help on where to get started and what to do first. Maybe you have read or heard about things to do in Tyrol and are not sure whether is doable, worth it, or simply don’t know where to start. This is why we are going to take you with us and guide you step by step through Tyrol's capital city, starting in the city centre. Big parts of the old town are only accessible to pedestrians which allows you to stroll around and admire the little shops and beautiful old houses. 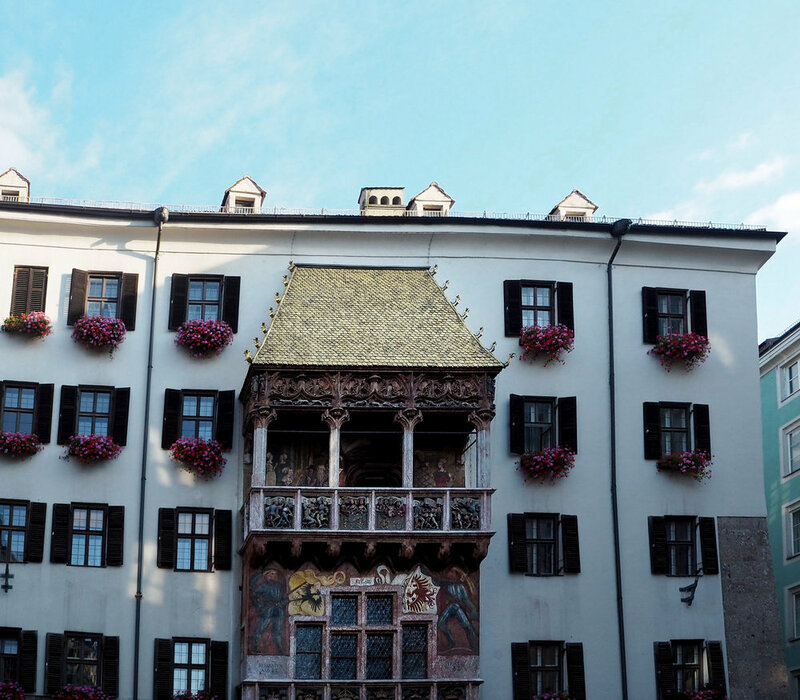 There, you can also find Innsbruck's best-known sight: The 'Goldenes Dachl' - the golden roof, which gets its name from the 2,657 fire gilded copper tiles that cover the roof. It was built around 1500 by Maximilian I, and has been well visited and admired ever since. The golden rood is located at the northern end of the ‘Herzog-Friedrich-Straße’ street, that leads you to the main street ´Maria-Theresien-Straße´ (named after the famous Austrian Empress), if followed south. This is where you can find many great restaurants, modern shops and even some shopping centres. In the middle of the street is the famous column 'Annasäule', which got is name 1703, after the last of the Bavarian troops and soldiers involved in the War of the Spanish Succession had left Tyrol. Looking north, you'll have a great view of the most famous mountain range of Tyrol: the ‘Nordkette’. If you follow this street further south, you will end up at the ‘Triumphpforte’. This triumphal arch was built in 1765 honouring the marriage of Spanish princess Maria Ludovica and Leopold II, the second son of Empress Maria Theresia. South of this arch, you can even see the well-known ‘Bergisel Ski Jumping Hill’, designed by famous architect Zaha Hadid, who also designed various other famous buildings in Innsbruck. That’s all for our first introduction to Innsbruck. This ‘tour’ should take you between half an hour and an hour, if you, however, decide to go shopping while in the ‘Maria-Theresien-Straße‘, you could perfectly well fill an afternoon of your trip with it.